Grand News is the best news & editorial focus design tool. So if you are a news editor or a blogger this clean and minimal WordPress theme will be the ultimate solution for you. This is 100% responsive so it looks awesome on all devices. It also includes predefined unique demos, which can be imported with only one click and are designed especially for news & editorial and much more. Responsive Design which fits on all mobile devices. Fully integrated with WordPress Customizer. It is capable of customizing every element of theme and you can also see preview instantly. Various content modules are included with this Drag and Drop Content Builder such as the advertisement, posts. You will get over 40+ pre-design beautiful templates and content blocks for news & editorial website and much more. So, without wasting any time just go for it! If you want to purchase a template only once and want to get a beautiful modern website with multiple layouts then INNOVATION is your solution, which is an excellent value WordPress theme for Magazine, Newspaper and Blog websites. You will find multiple powerful, money making tools which are the best time saver as well such as Mega Menu, a Page Builder, Shortcodes, Theme Options, Widgets and much more. You can also build creative layouts with the help of advanced Ruby page composer. It comes with sidebar section and fully supports Fullwidth This one is so flexible that you can create unlimited layouts. Along with that, the page composer also supports block layouts. This is not everything. Much more are waiting for you. So, without any second thought, just go for it. As you know e-commerce is indubitably one of the most beneficial methods to boost up businesses over the internet. 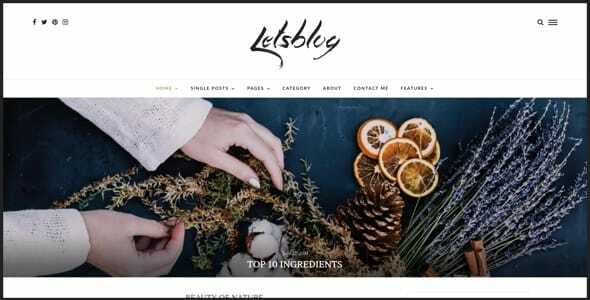 Lets blog is a minimalistic WordPress theme which looks great on all devices as it is 100% responsive. This is specially designed for blog and magazine websites and incorporated with latest WordPress technology. You will also get predefined styling for the blog post and various other impressive features. Have a look. Numerous options are available to customize your site with the live preview option. Try now, it’s free! 1 click demo install is available so you can easily get your website working in short time or you can also import each page or post individually. It has built-in live customizer so you can customize elements color, background, typography etc. and see the results instantly. So, if are looking for a great theme and best support, just go for it. You won’t be disappointed, guaranteed! Undoubtedly e-commerce is one of the most profitable methods for enhancing businesses especially for those who are interested in presenting their operations online. That is why a group of web developers & photographers worked hard to make e-commerce possible on WordPress. Your works will look amazing with a full-screen slideshow for Photo Gallery. Soledad also offers custom widgets among which YouTube video, Social Media icon, Popular Posts and various attractive features will irrefutably create a great impact on your clients. 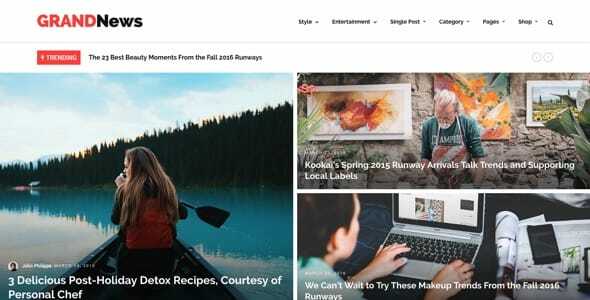 Soledad WP Theme – (current version 3.2 available for download), is Best Selling Blog & Magazine WP Theme of This Year. Get Soledad, Get Revolution slider for free. Soledad comes with pre-installed powerful & free Penci’s Plugins (Sidebar Layouts, Article Layouts, Portfolio Layouts are the blessings which come free with Soledad WP Theme) & Featured Video Background. Soledad is fully compatible with WooCommerce in order to sell anything. In short, it’s really an excellent stuff and definitely worth the money. This is absolutely translation ready. So you can translate your site into any language you want. Child theme which enables you to make different code changes. Bundled with Visual Composer which will cost you $34 only and much more. So try this beautiful theme now. 404 page and lot more. So what are waiting for? Go for it now. Multiple Comments system is supported which means not only WordPress but also Facebook or Disqus Comment System is also supported. Even you can change a block to make it work perfectly. Built in related posts which are based on tags, categories and authors and lots more. So try it once and you’ll surely fall in love with it. responsive Google Ads system and lot more. Along with that, you’ll get in-build drag and drop page builder. Simply use visual composer to build awesome responsive pages for ADMAG theme that too without any coding knowledge. The unlimited number of layouts can be made with the help of this extraordinary theme. And with the help of the Mega Menu, you can reduce the overall load just by selecting those contents which should be loaded in the menu bar. Different header footer can be used on different pages in your document. The review system helps users to evaluate the content by giving points and starts through which you can easily analyze your content and react accordingly. Apart from that, lot more other features are incorporated. So take your business to the next level with the help of ADMAG. 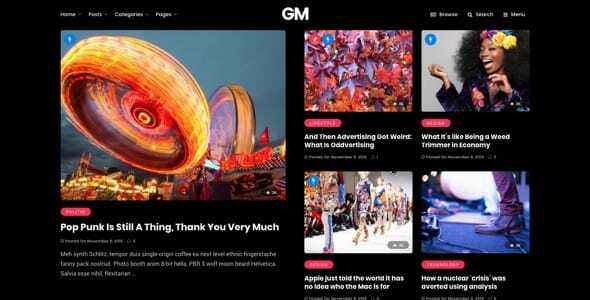 Millions of customers search for a theme like Smashing Mag and that is why we come up with this amazing theme The Reader, which has exactly the same feature like Smashing Mag. The popular and most wanted multicolored sidebars can be found here. This theme was the biggest challenge for us but the result we got was amazing. Just have a look at its predominant features. RTL Support and so on. Another new Homepage version is available. So without wasting time download it now. The awesome left sidebar is also an excellent design which makes it trendy. Apart from that, nice custom grid view, customization of your desired templates, different color versions, pixel-perfect design, will surely help to create a professional yet sophisticated site for your business. You’ll also be impressed with its unique design and dedicated support. And if you want you can take a quick screenshot of your home page. And just because of these various attractive features customers love to use it. So if you try it once you can easily understand why people recommend it. Sticky Menu & Smart Sticky Menu and lot more. So just go for it now. If you want a contemporary creative magazine theme then Onfleek will be the one-stop solution for you. This flexible, dynamic, and creative theme are capable enough to fulfill all your needs. It is powered with the latest technology such as AMP and designed with clean code. You’ll also find Built-in Social OAuth and all these things make it super fast and absolutely easy to use. 9 layouts are available to match each of your articles. So creating a perfect post to impress your valuable customers is absolutely easy now. You can choose your desired header which shoots your style and can provide a different look. 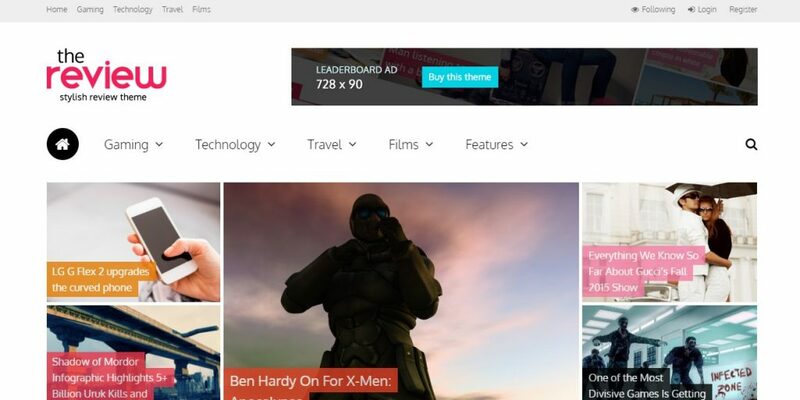 With 4 different layouts, you can simply expand the popularity of the listicles. As you know nowadays, ratings and testimonials are extremely important to capture the market and increasing credibility. So now you can rate everything on your taste. Simply give them a percentage, starts or points and let your customers know how excellent the services you are providing. Now, it’s time to look at some other dynamic features of this amazing theme. 5 ad areas are included. Beginner-friendly so that anybody can use it. Easy documentation and much more.